The Harold Ickes public housing development is one of the last to go through change under the Chicago Housing Authority’s Plan for Transformation, now in its 10th year. All around the city, renovation and rehabilitation has brightened up the city’s neighborhoods. New architecture both outside and inside has replaced decades-old buildings with outdated floor plans and replacement housing for residents of CHA who are eligible for the Right to Return. As a long-time resident of Ickes, the most often question I am asked is, “What are ‘they’ going to do with Ickes?” And further, “Are ‘they’ going to tear down, rehabilitate or redevelop?” My answer is, “I don’t know.” I have inquired of persons in high places, and so far, the latest answer has been, “Nothing has been determined yet.” That was from Matthew Aguilar, CHA spokesperson. Aguilar did promise to inquire further and get back to me. I wait patiently. In January and February, the Chicago Housing Authority (CHA) Board approved important changes to its work rules for tenants and to the Plan for Transformation. Attendance is low in our community because redevelopment is slow,” declared William Fleming, a resident of the Cabrini-Green pubic housing complex, to members of the Chicago Board of Education on Feb. 25. Fleming’s daughter attends Schiller Elementary School, 640 W. Scott St. Next school year, Schiller will be consolidated because of low enrollment. It will cease to exist and students will be re-enrolled into Jenner Elementary, 1119 N. Cleveland Ave.
William Fleming, a resident fo the Cabrini-Green public housing complex, testifying at the Chicago Board of Education hearings on school closures in February 2009. Fleming expressed concerns about the possibility of overcrowding that could result from relocating Schiller Elementary School students into a nearby school. Fleming was among many voices addressing school officials over the changes to the school system. 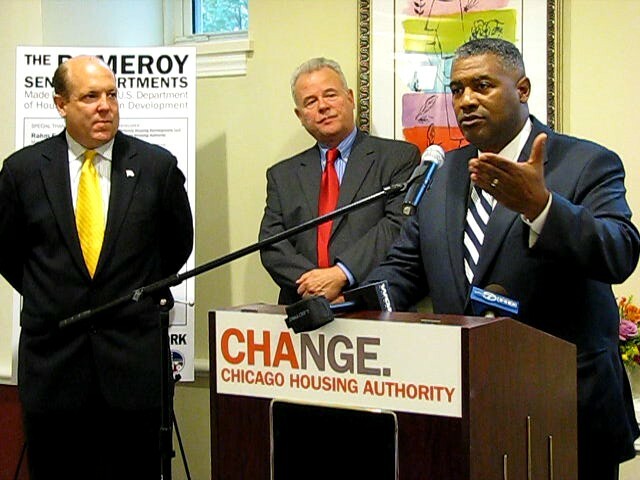 He and other public housing residents blamed the Chicago Housing Authority’s (CHA) Plan for Transformation for the closings, turnarounds, consolidations and phase outs of 16 public schools in predominantly African American and Latino low-income neighborhoods. “In Cabrini-Green, we have a right to return, a federal right to return,” Fleming said. “Over 600 [public housing] units will be built within the next 18 months with the minimal bedroom size being three for Chicago school children between K and eighth [grade],” he added.